Timing is everything. I used the same trivia question back in 2012 (Who is known for saying “If you don’t do it this year, you’ll be another year older when you do!”?) and received no answers! But with Warren Miller’s recent death, this time I received plenty of correct answers! 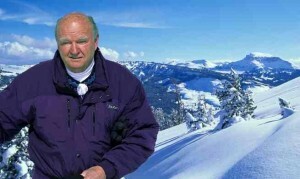 Robert Pandaleon answered “the voice of skiing, Warren Miller!” How true that is. Yes, there are the films, but his voice doing the narration was so unique. You could be blindfolded and recognize that voice anywhere. And then there are the quotes. It was great to see some of the most popular ones on the message boards around the ski area this past week. Gary Tomlinson responded all the way from Fernie, BC. Bill Kornrumpf of the Schenectady Wintersports Club recalled hearing the quote when the club hosted Warren Miller and his movies in the 1960s. Bill also used the quote as motivation for his cross country bike ride back in 2011! Chuck Perkins remembers the day he spent skiing with Warren at Vail a few years back. Warren’s style was fast cruising and Chuck was fine with that. They shared stories and Chuck says it was one of his most memorable days of skiing ever. Saturday on the gondola, Bob Burley shared a story from his younger days. Warren Miller talked Bob and some other young guys skiing at Arapahoe Basin in Colorado to knock off cornices and follow them down the slope. Bob says it took him a little while to determine that Warren didn’t care whether it was safe or not, as long as it made for a good movie! Warren Miller’s life story is pretty well known. He came from a dysfunctional family with an alcoholic father; joined the Navy during WWII when he was 18. After the war he became a ski bum and eventually a ski bum with a camera! 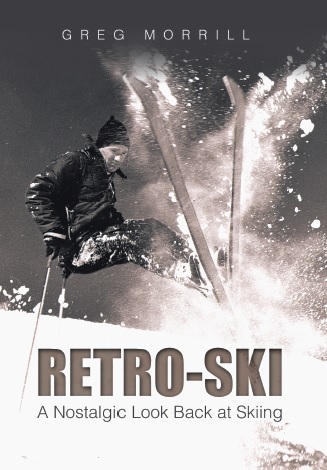 Starting in 1950 he produced a major ski film every year until 2004. 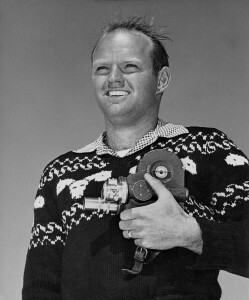 Warren Miller was influenced by the ski filmmakers that came before him. He particularly mentioned John Jay who in turn was influenced by Stowe’s own Vic Coty. The self-narration, the humor can be traced back to Vic. Warren Miller also did a TV series. Capitalizing on Jean Claude Killy’s popularity, Warren produced the “Killy Style” during the 1968-69 season. The weekly show followed Killy to various ski resorts and of course, showed lots of skiing. In more recent years tensions arose between Warren Miller and the company that bears his name, Warren Miller Entertainment. In 1988 Warren turned the company over to his son, Kurt, but did maintain some of the artistic control. Since then the company has changed ownership several times and Warren Miller no longer had any control over the company that bears his name, either artistic or financial. Warren was actually critical of the films that bore his name. “It takes a great deal of time and thought to provide an entertaining film, with rhythm and different features than just extreme skiing.” When Warren lent his voice to a competing filmmaker’s ski movie, Warren Miller Entertainment sued Warren Miller over the use of his name! Warren Miller inspired me to make my own home ski movies. When a group of us started taking yearly ski trips to some interesting destinations, it seemed a natural to film the action. I wasn’t a threat to Warren, but they still provided good memories that helped us get psyched up for the ski season. I should clarify and say that those of us who appeared in the movies really enjoyed watching them. Not everyone who wasn’t in the movies, such as spouses, greeted them with the same enthusiasm. I’ve had them digitized complete with soundtrack and they still bring back some great memories!